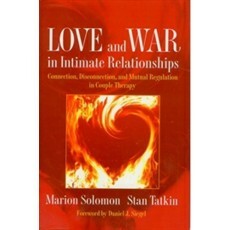 Love and War in Intimate Relationships: Connection, Disconnection, and Mutual Regulation in Couple Therapy (Norton Series on Interpersonal Neurobiology) By Dr. Marion Solomon Published by W. W. NortonWhat happens between partners that makes love turn to war? How can couples therapists help deescalate the battles? Two leading therapists apply the latest neuroscience research on emotional arousal to help couples regulate each other's emotions, maintain secure attachment, and foster positive, enduring relationships.The neurobiologically-grounded and sensitive approach set forth by Solomon and Tatkin in this book is sure to transform the way clinicians understand and treat couples in therapy. Reviews "Reading this book was a sheer pleasure, and I did not skip a word. It is an artful theoretical and clinical integration with no wasted words....In this innovative couple therapy, they have documented the healing power of couples learning to take care of each other and put to rest the myth of the healing capacity of the autonomous self. I recommend this instructive book to all therapists....I hope this project gets lots of deserved attention." - Harville Hendrix, PhD, author of Getting the Love You Want "